Links to festivals, organizations, and venues. 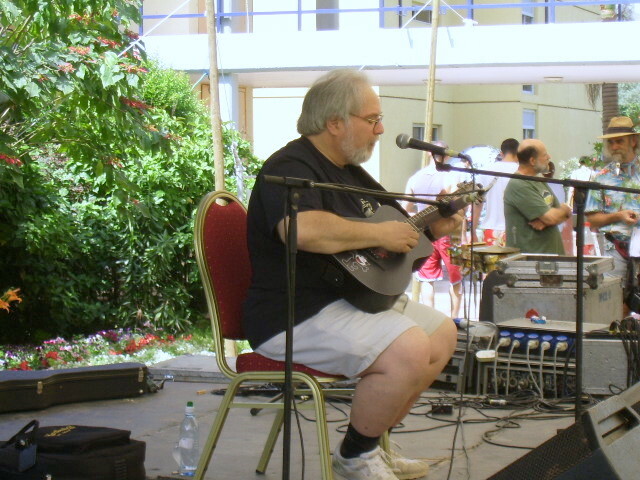 Steve Suffet at the Jacob's Ladder Folk Festival. Nof Ginosar, Israel. May 5, 2007. Meets Thursday evenings at the Black Swan Inn, a beautiful 15th century public house in York, England. Sponsors concerts and other folk music events in Rockland County, NY. The home of the annual Woody Guthrie Birthday Bash, 2007-2012, as well as one of the hippest venues in New York City. Music, poetry, performance art, and much more. Meets Monday evenings at the Foots Cray Social Club in Sidcup, Kent, England. Community based organization in Brooklyn, NY, which nurtures and develops youth leadership for peace and justice. El Puente (Spanish for The Bridge) has a strong arts program, which includes music and other performing arts. Meets Sunday afternoons at the White Hart Pub in Grays, Essex, England. This folk club meets Friday evenings at the Grove Inn in Leeds, England. Also known as the New York Pinewoods Folk Music Club. Sposnors folk music events within the five boroughs of New York City, plus weekend retreats in the country. Sponsors folk music and dance events in Washington, DC, and its environs. Founded in 1906 and located in the town of Glossop, east of Manchester, this is one of the oldest independent socialist social clubs in the United Kingdom. It regularly hosts many cultural events, including live musical performances. Usually presents a show one Sunday each month at the Old Stone House in Park Slope, Brooklyn, NY. Sponsored by the Labor Heritage Foundation, this get-together takes place each June in Silver Spring, MD, just outside Washinton, DC. Participants include musicians, poets, film makers, photographers, playwrights, graphic artists, and more. Currently meets Thursday evenings at the Taproom Pub in Islington, London. Held each May in Nof Ginosar, Israel. Located in the Red Hook section of Brooklyn, Jalopy has become one of the premier venues for folk music in New York City. Union of traveling musicians in the USA and Canada. Think of it as a "non-local" local. Meets Thursday evenings at the New Inn in Maidenhead, Berkshire, England. Held each April in Mansfield, MA. The festival is commonly know as NEFFA after the New England Folk Festival Association that organizes the annual event. Affiliated with Folk Alliance International, NERFA holds a get-together every November at the Hudson Valley Resort and Spa in Kerhonkson, NY. Originally called Orpington Friday Folk, the music is now not always folk and not only on Friday. The location is still the same in Orpington, a village in the outermost southeastern part of Greater London. Brings together progressive political activists and musicians throughout North America. New York City. Since 1979 the Peoples' Voice Cafe has been a venue for performing artists who have something important to say and the voice with which to say it. Shows take place on Saturday evenings from mid-September to mid-May. Sponsors folk music events in and around Philadelphia, including the Philadelphia Folk Festival. 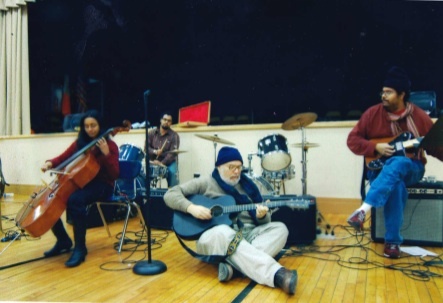 Located in Jackson Heights, Queens, NY, one of the most ethnically diverse communities in the USA, the Renaissance Charter School has hosted folk music events ranging from coffee house nights to concerts to weekend festivals. It has even published its own songbook and accompanying CD. Sponsors concerts and other folk music events in Richmond, VA. Meets on Sunday evenings at Ruskin House in Croydon, England. That's about as far south as you can go and still be within one of the Boroughs of London. Meets on Tuesday evenings at Cecil Sharp House in London. Meets Tuesay evenings at the Admiral Pub in Glasgow. Meets Wednesday evenings at the Aubergine Cafe in Woodside, Queens, NY. The club originally met in nearby Sunnyside, Queens, NY, and kept the name. Australian website with a database of more than 500 songs of struggle, almost all in English, from around the world. A socialist folk club that meets the last Monday evening of each month at the Torriano Meeting House in the Kentish Town section of London. Meets Monday evenings at the Angel, a pub in Waltham Abbey, Essex, England. Meets Sunday evenings at Ye Olde Rose and Crown Theatre Pub in Walthamstow, London. The best source for everything having to do with Woody. Go to Steve Suffet's home page. with Varuni Tiruchelvam, Hector Sanchez, and Carlos Rosello. Brooklyn, New York. December 23, 2008.